Back once again this summer is the well-known Haddonfield Crafts and Fine Art Festival in downtown Haddonfield. The streets will be filled with color and creativity from artists across the region. 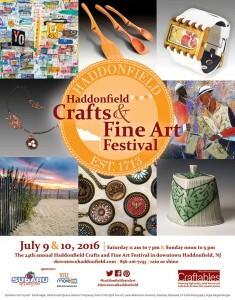 The Haddonfield Crafts and Fine Art Festival is returning for its 24th year on Saturday, July 9 and Sunday, July 10. This two-day outdoor festival, which attracts crowds of more than 100,000 people, will be held Saturday from 11 a.m. to 7 p.m. and Sunday from noon to 5 p.m. along Kings Highway between Washington Avenue and Haddon Avenue and along Tanner Street to Euclid Avenue. “The Haddonfield Crafts and Fine Art Festival is a festival that brings together artists, crafters, shoppers and festival-goers to celebrate the arts, families, Haddonfield and South Jersey,” Festival Director Marcy Boroff said. Downtown Haddonfield will be transformed into a festive corridor, alive with a plethora of artists’ tents, outdoor cafés, musicians and more. Artisans will exhibit a wide range of arts and crafts, including ceramics, glass, jewelry, wood, fiber, metal, paper, drawings, paintings, photography and wearable art. More than 260 vendors showcasing the best of crafts and fine art from the region and beyond will be there. There will be old and new artists to enjoy. Artists such as JuNxtaposition, Creatively Obsessed, FUNiture, SheCre8s, veryDonna, High Strung Studios, Angular Art and more bring new life to old typewriter keys, antique buttons, vintage silverware, guitar strings, casted-off furniture and more. Boroff said there will be something for everyone and everything, including pets. For a list of artists and a gallery to their work, visit renaissancecraftables.com. There will not only be artists, but music and children’s entertainment to enjoy. On Saturday, DJ Frank Staff will be in Kings Court and on Tanner Street from noon to 4 p.m. and on Sunday, the Lonesome Turnpike Ramblers will be in Kings Court from noon to 4 p.m. and DJ Frank Staff will be on Tanner Street. For children, there will be face painting, games and the opportunity to meet Princess Ariel, who will be in front of Enchanted Dreams on her throne for photos between 2 p.m. and 4 p.m. on both days of the festival. The mermaid princess is presenting each child a special gift from under the sea. Enchanted Dreams is located at 9 S. Haddon Ave. This free event is easily accessible from area bridges or by taking the PATCO Speed line to the heart of the shopping district. Parking in Haddonfield is also free during the two-day festival. “I hope visitors shop and enjoy meeting artists; I hope they enjoy learning about the process of creation; and I hope they find the thing they been looking for and something they never expected to find,” Boroff said. More information can be found at www.downtownhaddonfield.com.